At the Girijabandh Hanuman Temple located at Ratanpur in Chhattisgarh, Hanuman is worshipped in the form of a woman. This mandir is located around 25 km from Bilaspur. Hanuman is believed to have given darshan to a king of the region in this form. The king was suffering from leprosy. 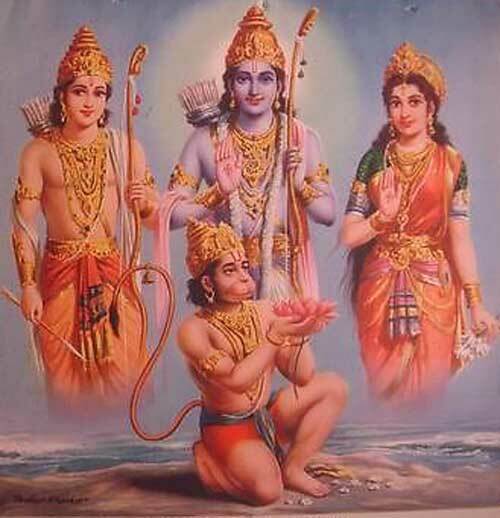 Once he had a dream in which Hanuman asked him to build a temple dedicated to him. He also asked to make a pond near the temple. For early cure from leprosy, Hanuman asked the king to worship in the temple and take bath in the pond. The king built the temple but could not find an ideal murti (idol) to consecrate in the temple. He then had another dream in which Hanuman told that there is a murti hidden in the pond in the Maa Mahamaya Temple. The murti that was retrieved from the Maa Mahamaya Temple was the female form of Hanuman. The murti faces south. The murti is of Hanuman defeating Ahiravana in the netherworld. There are also the faces of Sri Ram and Lakshman carved on each shoulders. It is widely believed by devotees that wishes are fulfilled after offering prayers in the temple.